Jenny Morris, aka The Giggling Gourmet, is one of SA’s most beloved food personalities. 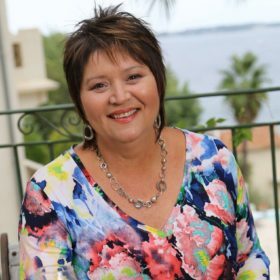 A woman of many talents – author, magazine writer, radio and TV presenter, celebrity chef, teacher and culinary tour guide – we love Jenny’s generous spirit and fun-loving energy. In addition to her impressive list of accolades, her eatery Yumcious Café has become a popular Cape dining destination, now in multiple locations. Getting presidents and heads-of-state to eat with their hands, down-to-earth Jenny has also charmed celebrities like Prince Charles, Charlize Theron and Al Gore with her tantalizing dishes. Neighbour to our Cape Quarter salon, we regularly have the pleasure of her delightful company. Wherever she goes there’s magic. We have the privilege of ensuring Jenny’s hair, nails, brows and lashes are always camera-perfect and kitchen-ready. “Their stylists are professional and on the ball with the latest trends. The service is absolutely outstanding and every client that steps over the threshold is treated like gold. Gina has a very high standard and her staff never fail to deliver what she wants.